Definition and description of the English Horn. Despite its name it is not a horn - this instrument is more similar to an oboe. The English Horn can be described as a double-reed woodwind instrument similar to an oboe, but lower in pitch. The English Horn differs slightly in construction from the oboe; the conical bore of the wooden tube is wider and slightly longer, and there is a larger globular bell and a bent metal crook to which the double reed mouthpiece is attached. A woodwind instrument formerly much in use the English Horn had evolved from the Shawm which was gradually developed into the hautboy which was in turn improved and provided with key-work. It is not known exactly when this change took place. This instrument is also commonly known as the English Horn. Family of Instruments: The English Horn belongs to the family of Woodwind instruments. 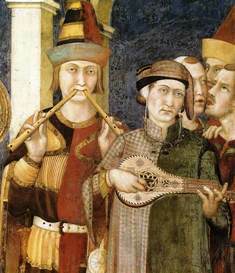 Medieval Musical instruments, including the English Horn, would be used by the musicians of the period including the Waits, Minstrels or Troubadours. There were three categories of musical instruments in the Middle Ages - wind, string and percussion. Terms of description were Bas instruments and Haut instruments. Bas referred to soft instruments (literally, "low," but referring to volume, not pitch) which were suitable for the chamber which included the vielle, rebec and other bowed strings, the lute and other plucked strings. Haut referred to loud instruments (literally "high" but referring to volume, not to pitch) which were suitable for outdoors which included the shawm, sackbut, pipe and tabor. Read the above history, facts and information about the English Horn. The Medieval Times website provides interesting facts, history and information about the musicians and styles of music which scatter the history books including English Horn. The Medieval Life and Times Sitemap provides full details of all of the information and facts about the fascinating subject of the lives of the people who lived during the historical period of the Middle Ages. The content of this article on English Horn provides free educational details, facts and information for reference and research for schools, colleges and homework for history courses and history coursework.